Intumescent Fire Grilles - Fire Door Protection. Comprehensive range of sizes includes circular types. For use in doors & solid block walls. Suitable for mounting up to 1,000mm (1m) from floor level. In excess of 30 or 60 minutes fire rating. Vermin proof wire mesh 80% free area. A durable ventilation grille which is easily mounted in doors & solid block walls, and can provide in excess of 1/2 or 1 hour fire protection. Astroflame Fire Grille comprises of a moisture resistant intumescent core within a galvanized steel frame with vermin proof 6mm steel mesh fitted to both faces. Suitable for fitting up to 1,000mm (1m) from floor level. The design allows a free area of 80% approximately. See our Free Area table below for guidance. 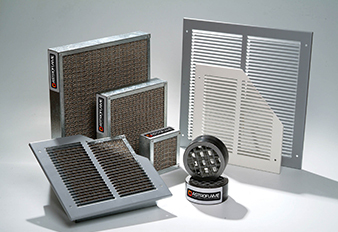 All square and rectangular grilles are available to suit 30 minute or 60 minute fire rated applications. Maximum single grille size is 600 x 600 mm or equivalent area. Circular grilles are available in 100, 125, 150, 200, 225, 250 and 300mm diameter sizes and are 60 minute fire rated. Free Area Table: Astroflame Intumescent Fire Grilles. Calculations made using 80%(approx) free air flow Please note that this table does not allow for the effects of fitting any of the Astroflame Steel Louvred Face Plates, or any other type of aesthetically pleasing cover over the fire grille. ©1996 Astroflame (Fireseals) Ltd.